65 Marlborough is located on the north side of Marlborough, between Berkeley and Clarendon, with 63 Marlborough to the east and 67 Marlborough to the west. 65 Marlborough was built in 1876 by J. and H. M. Harmon, builders, as the home and medical office of Dr. Francis Minot, a physician. He shown as the owner on the original building permit application, dated June 1, 1876, and on the final inspection report, dated May 8, 1877. No architect is indicated on the permit application, nor on the inspection report. Francis Minot purchased the land for 65 Marlborough on May 24. 1876, from Frank William Andrews, trustee for the benefit of Annie L. Bigelow and Prescott Bigelow (his niece and nephew, the children of Prescott Bigelow and Caroline Thatcher (Andrews) Bigelow). Frank Andrews had purchased the land from the Commonwealth of Massachusetts on July 30, 1868; the land originally had been under contract to John Lowell Gardner, who transferred his right to buy it to Prescott Bigelow, who died in October of 1863 before he could complete the purchase. Click here for an index to the deeds for 65 Marlborough. Francis Minot was a widower (his wife, Sarah Parkman (Blake) Minot, had died in 1869) and he lived at 65 Marlborough with his daughter, Julia. They previously had lived (and he had maintained his office) at 7 Charles. His unmarried sister, Mary Minot, lived with them until her death in February of 1882. Dr. Minot continued to live at 65 Marlborough during the 1895-1896 winter season, but moved thereafter to Milton, where he died in May of 1899. By the 1896-1897 winter season, 65 Marlborough was the home of Francis Blackwell Forbes and his wife Isabel (Clarke) Forbes. They previously had lived in New York, Shanghai, and Paris, where he was a partner in the Boston-based shipping firm of Russell & Company. He was also a dedicated botanist and, with William Botting Hemsley, authored a book on the plants of China. Frances and Isabel Forbes leased 65 Marlborough from Francis Minot and, after his death, from his estate. They continued to live there until 1904, when they purchased and moved to 114 Commonwealth. On January 15, 1904, 65 Marlborough was purchased from Francis Minot’s estate by Harriet (Parker) Reynolds, the wife of Dr. Edward Reynolds. Edward Reynolds was a gynecologist. He and his wife had lived at 130 Marlborough, where he also maintained his medical offices. 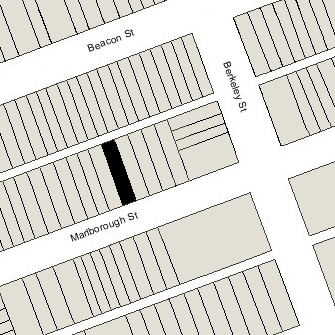 They moved to Readville in about 1904 and purchased 65 Marlborough to be his Boston office. Also listed in the Blue Books with medical offices at 65 Marlborough were Dr. John B. Hawes, II (in 1905 and 1906) and Dr. Richard Goodwin Wadsworth (from 1905 through 1908). Dr. Wadsworth and his wife lived at 323 Beacon, where he also maintained a medical office. Dr. Reynolds continued to maintain his medical office at 65 Marlborough in 1909. On April 30, 1909, 65 Marlborough was purchased from Harriet Reynolds by attorney Philip Dexter, He and his wife, Edith (Wood) Dexter, made it their home. They previously had lived at 29 Massachusetts Avenue. They also maintained a home in Manchester. The Dexters hired architect and interior designer Ogden Codman, Jr., to provide interior decoration of their new home. On June 1, 1909, Philip Dexter transferred the property into his wife’s name. In June of 1917, Edith Dexter purchased 67 Marlborough. She first leased it to the British War Relief Society of New England and then to Dr. George Oliver Clark, a physician, and his wife, Alice Carnzu (Abbot) Clark. 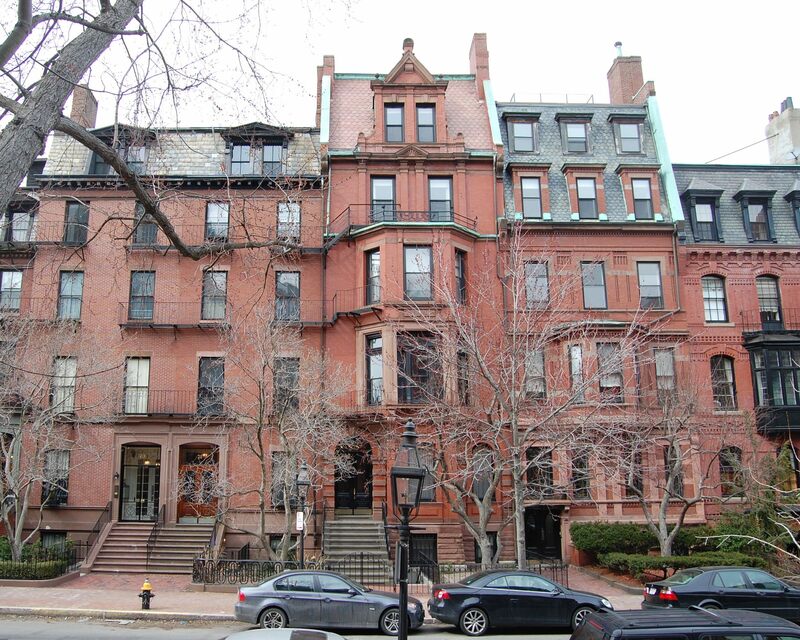 The Dexters’ son, William Dexter, who was an attorney in his father’s firm, lived with them at 65 Marlborough. He married in April of 1923 to Constance Van Rensselaer Thayer. 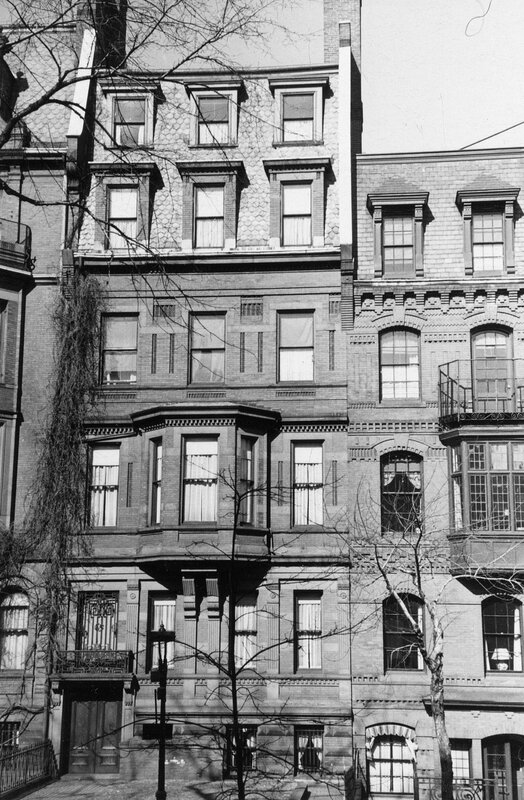 After their marriage, they lived briefly at 6 West Hill Place and then with his aunt, Miss Rose Linzee Dexter, at 400 Beacon. The month before their marriage, Edith Dexter had transferred 67 Marlborough to him, and by the 1925-1926 winter season, William and Constance Dexter had made it their home. Philip Dexter died in July of 1934. Edith Dexter continued to live at 65 Marlborough until her death in February of 1942. 65 Marlborough was inherited by her son, William. By 1943, 65 Marlborough was the home of Louisa Blair (Rogers) Stanwood, the widow of Francis Manning Stanwood, who had been owner and editor of the Boston Journal and later president of the Hotel and Railroad News Company. Their unmarried adult children, Louise Rogers Stanwood and Francis Manning Stanwood, Jr., lived with her. They had lived at 282 Marlborough in 1942. They continued to live at 65 Marlborough in 1944. The house was shown as vacant in the 1945 City Directory. William Dexter had died in February of 1943, and on September 5, 1945, 65 Marlborough was purchased from his estate by Mary Louise (Ramsdell) Spaulding Harwood, the former wife of attorney Bartlett Harwood. They had lived at 205 Commonwealth in the 1930s and then at 49 Beacon; in 1945, after their separation, she had lived at 127 Bay State Road. She continued to live at 65 Marlborough until about 1950. On April 21, 1950, 65 Marlborough was purchased from Mary Harwood by Michael (Max) Lilly, a partner in the Lilly Construction Company with his father, Harry Lilly, and brother, David Lilly. Michael Lilly and his wife, Goldie Gertrude (Karess) Lilly, lived in Brookline. In May of 1950, he applied for (and subsequently received) permission to convert the house from a single-family dwelling into eight apartments. On April 30, 1951, Michael Lilly transferred the property to Sixty-Five Marlboro, Inc., of which he was the treasurer, and on September 26, 1958, it transferred the property to Michael Lilly’s brother and business partner, David Lilly. The property subsequently changed hands, and on May 14, 1966, was acquired by Dr. Donald P. Barker, a physician, and his wife, Joan A. Barker. They lived in one of the apartments. Joan Barker died in March of 1971. On December 18, 1978, 65 Marlborough was purchased from Donald Barker by the 65 Marlborough Realty Corporation (Paul Roiff, president). That same month, it applied for (and subsequently received) permission to remodel the house into six apartments. In February of 1979, it amended its plans to add an additional partial floor covering approximately 35 percent of the roof. 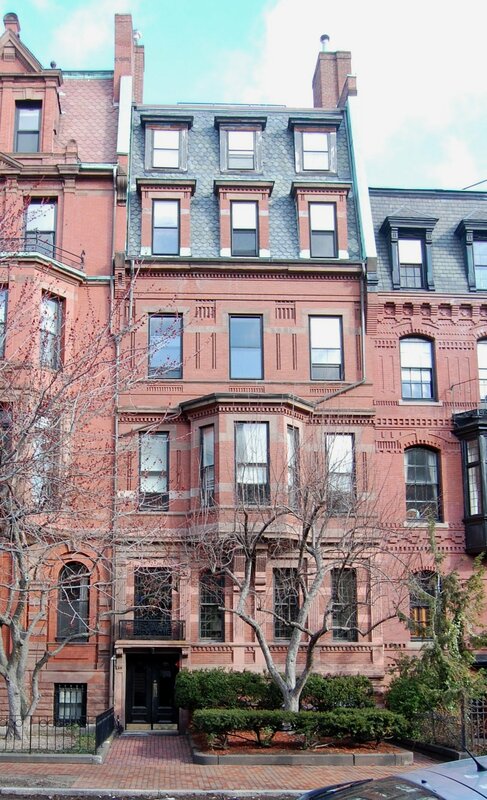 On March 8, 1979, it converted the property into six condominium units, the 65 Marlborough Street Condominium. On October 27, 2017, the condominium unit owners amended the master deed to reduce the number of units to five, reflecting consolidation of two of the previous units.